HMS MOHAWK'S WASP ON SAFARI. SEPTEMBER 1964, TSAVO NATIONAL PARK, KENYA. DURING THE VISIT OF THE FRIGATE HMS MOHAWK TO MOMBASA THE SHIP'S WASP HELICOPTER AND SIX FLIGHT MAINTENANCE RATINGS DISEMBARKED FOR FLYING OPERATIONS, WHICH INCORPORATED A SAFARI IN THE TSAVO. 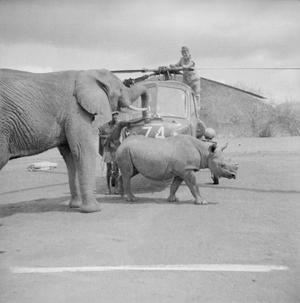 THE FLIGHT ENCAMPED ON THE GALANA RIVER FOR SIX DAYS AND CONDUCTED A COUNT OF RHINOCEROSES IN SELECTED AREAS IN CONJUNCTION WITH THE ASSISTANT WARDEN OF THE PARK, MR P R JENKINS. THIS COMPLETED, THE HELICOPTER AND CREW MOVED TO HEADQUARTERS AT VOI WHERE SORTIES WERE FLOWN TO ENABLE WARDENS TO OBTAIN PHOTOGRAPHS OF ELEPHANTS AND RHINOS. An elephant and a rhino walk sedately past HMS MOHAWK's Wasp helicopter during the count in Tsavo National Park.